We understand there will now be no public meeting at the Mount Wise tower blocks as it has been agreed the cladding will be taken down over the next few days. It emerged today the materials used on the outside of the three high rise blocks were similar to cladding on Grenfell Tower in London which went up in flames last week causing the deaths of at least 79 people. We extended the Devon and Cornwall Local Live feed tonight to cover the breaking news and will be back in the morning with all the latest stories. Devonport MP Luke Pollard said "most of the fire safety measures" in the Mount Wise blocks are "very good". "It is just the difficulty with the exterior," he said as it emerged that cladding is made from similar material to the cladding on the Grenfell tower where at least 79 people lost their lives in a huge blaze last week. "Once those start coming down and are replaced that will reassure an awful lot of residents." The cladding on the three 26-storey blocks will be removed in the next few days it has emerged. A resident of Lynher tower has spoken of her concern following a fire in the block three months ago. Chloe Brewster said they were alerted to the blaze by people throwing stones at their window. Cladding at the Plymouth tower blocks is made from material similar to the cladding on Grenfell Tower - where at least 79 people lost their lives last week. Cladding will be removed in the next few days which has been judged to be a safety risk at three high rise blocks in Plymouth. Tests show cladding on one of Plymouth's Mount Wise tower blocks is made from similar material to the cladding on the Grenfell tower - where at least 79 people lost their lives in a huge blaze last week. Tests showed the panelling is aluminium coated with a polyethylene core, the lowest fire safety rating. Plymouth Community Homes says it's taking extra fire precautions. Devonport MP Luke Pollard is about to meet residents of at-risk Mount Wise tower blocks in Plymouth. The Labour MP has called for "urgent action" and for the blocks to be reclad after safety concerns were raised following tests. Mr Pollard said: "I want the tower blocks re-clad urgently and I want to make sure that the residents of the towers and those who live nearby have the answers to their questions." Managers Plymouth Community Homes say they will install sprinklers and heat detectors on the 26-storey blocks. Tests show cladding on one of the three Mount Wise tower blocks is made from similar material to the cladding on the Grenfell tower - where at least 79 people lost their lives in a huge blaze last week. Residents of at-risk tower blocks at Mount Wise in Plymouth are advised to stay put if there is a fire in the building. A poster in the blocks says: "Stay in your flat until advised by the Fire Service." A young mother has told the BBC that there were no alarms when a fire broke out in her block in February. Managers Plymouth Community Homes said they took fire safety"extremely seriously". Tests show cladding on one of the three 26-storey blocks is made from similar material to the cladding on the Grenfell tower - where at least 79 people lost their lives in a huge blaze last week. Police are at the scene in Devonport where it has been revealed that three tower blocks have cladding that is rated with the lowest score on a fire safety scale. Residents are meeting with landlord Plymouth Community Homes, which is responsible for maintaining the building, as well as local politicians tonight. A young mother in a Plymouth tower block at risk of fire due to cladding said she could not sleep after the blaze at the Grenfell tower in London which claimed the lives of at least 79 people. Chloe Brewster told the BBC: "All I had in my head was our flat going up on fire and the whole tower block going up in flames." She and her partner asked to be rehoused after a fire in February in her 26-storey Lynher block. She said there were no alarms in the fire and she was alerted by someone throwing objects at her window. Tests show cladding on one Plymouth's Mount Wise tower blocks is made from similar material to the cladding on the Grenfell tower - where at least 79 people lost their lives in a huge blaze last week. A mum who had to evacuate her third floor flat in the Mount Wise blocks with her baby said there were no alarms. Chloe Brewster was alerted to the fire in the Lynher block in February by someone throwing objects at her window. "My daughter was only seven weeks old and we wrapped her up and ran down the stairwell," she said. "There was loads of smoke coming out and we got out as quickly as we could. "There was no alarm - if we had gone to sleep we wouldn't have known anything about it." Luke Pollard, Labour MP for Devonport where three tower blocks have been judged at risk following inspections, has called for "urgent action" to make the buildings safe. He said: "I want the tower blocks re-clad urgently and I want to make sure that the residents of the towers and those who live nearby have the answers to their questions." Mr Pollard said the government should foot the bill. He said: "In times of national emergency, and this is one of them, it is right the government provides the extra support that is needed." Residents of three tower blocks at risk from combustible cladding in Plymouth have been told managers take safety "extremely seriously". Managers Plymouth Community Homes said: "We concentrate hard on fire prevention and are never complacent." Tests show cladding on one Plymouth's 26-storey Mount Wise tower blocks is made from similar material to the cladding on the Grenfell tower - where at least 79 people lost their lives in a huge blaze last week. Tests showed the panelling is aluminium coated with a polyethylene core - materials which have the lowest fire safety rating. Plymouth Community Homes says it's taking extra and immediate fire precautions including installing sprinklers. The three red, blue and green Mount Wise towers judged a fire safety risk after an inspection are a major landmark for the Devonport area. The 26-storey towers were designed and built in the early 1960s. Originally the proposals for the area included six towers instead of three. In 2014 the residents were consulted on improvements which included "upgrading the thermal fabric" of the buildings according to a report to managers Plymouth Community Homes. It is not known what measures were taken but cladding which was tested on one block was found to be a fire risk and safety measures are being taken on all three. A senior police officer says the 999 service is more used in the summer, and the demand is already rising. Kevin Foster, the Conservative MP for Torbay, urged the Prime Minister to let MPs debate the outcome of the public inquiry into the Grenfell Tower fire when it is published. He told Parliament: "It seems almost inconceivable that an organisation spent £8.7m refurbishing a tower block and didn't include inflammable cladding and a sprinkler system." Theresa May says tests on a number of tower blocks, including the Mount Wise blocks in Plymouth, have revealed that the cladding on them is "combustible". At least 79 people died in the fire. Six hundred high rise buildings in England are being checked to find out if they have similar cladding. The new Intercity Express Train has made its maiden voyage to Cornwall this morning, as part of a test journey from London Paddington to Penzance. The new Intercity Express Train left London Paddington at 05:33 and arrived at Penzance Station at 11:01. Transport minister Paul Maynard said: “We are upgrading our railways to deliver the biggest modernisation programme for over a century and the improvements that passengers have asked for. Residents of the 26-storey Lynher, Tamar and Tavy buildings in Devonport have been told of a potential fire risk to their buildings. Tests showed the panelling is aluminium coated with a polyethylene core, the lowest fire safety rating. Plymouth community homes says it's taking "extra and immediate fire precautions" including installing sprinklers and heat detectors in each of the blocks. The newly-elected Labour MP for Plymouth Sutton and Devonport, Luke Pollard, is calling on the government to pay for new safer cladding for all three tower blocks at Mount Wise. Managers of three at-risk Mount Wise high-rise blocks in Plymouth say they are taking "extra and immediate fire safety precautions". It comes after the Mount Wise blocks were found to be covered in combustible cladding following safety tests. It is suspected the material used to clad the exterior of the west London block accelerated the spread of last week's blaze, which has killed at least 79 people. Managers Plymouth Community Homes said: "We are completing further checks today to ensure all fire doors remain in place and closers are fitted and operating as they should be. "We are installing additional fire protection to the interiors to the stairwells of each tower today as an extra fire safety measure." Installing heat detectors into every flat in addition to the current mains-wired smoke alarms. A sprinkler system will be installed in each of the towers. Mount Wise Tower in Plymouth is among seven residential high-rise buildings across England found to be covered in combustible cladding following safety tests. Plymouth Community Homes said of the at-risk high-rise: "It has been found to be aluminium coated with a polyethylene core, which has been rated as category 3 under the new controlled test conditions. "The fire rating scale goes from 0 to 3 (with 0 being the highest safety score and 3 being the lowest)." 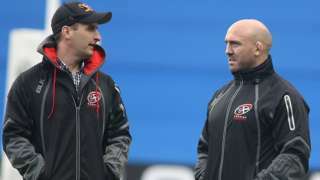 Cornish Pirates coach Alan Paver says he and his side "will be better" this season as they look to improve on their sixth-placed Championship finish. Paver, along with joint-boss Gavin Cattle, has spent time with Super Rugby sides in New Zealand this summer. "We've been out to different high-performance environments. We've come back, and grown a lot," Paver told BBC Radio Cornwall. "We've accelerated, and this group has, but this is a results-based business so sometimes you can be better." Coach Alan Paver says Cornish Pirates will improve this term as they look to better their sixth-placed Championship finish.